If your explorations of psychoanalysis have led you into the realms of modern neuroscience, you've probably read a book or article or two by Eric Kandel. A few months ago Kandel spoke at the winter meeting of the American Psychoanalytic Association, pitching the need (as have others) for psychoanalysts to be more active in adding to the body of empirical data on psychoanalytic treatment outcomes. Just a day or two after many of my colleagues gathered to celebrate the life of environmental justice activist Judy Bonds, we got word that another West Virginian – a man named Frankie Mooney – had died. I never met Frankie, but when I heard his story I felt very connected to him through a specific sense that all human beings share: a sense of home. It's possible that I don't need one more blog -- I already have a bunch and don't get back to post on them as often as I imagined I would. 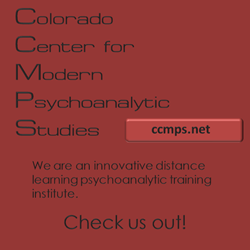 This one will be a little different in that I intend to invite other people to blog with me -- specifically, at least in the beginning, people with whom I've taken classes over the the past 22 years at the Colorado Center for Modern Psychoanalytic Studies.